Leave it to a first-rate museum with a great permanent collection to host an annual gala for a local super affluent seasonal community, enticing these art aficionados into wearing their full evening regalia and making the opening night of a remarkable exhibition titled To Jane, Love Andy: Warhol's First Superstar a spectacular experience filled with beautiful people dressed to the nines (see my show review titled "The Perfect Storm" http://www.huffingtonpost.com/bruce-helander/to-jane-love-andy-warhols_b_5016703.html Not surprisingly, in Palm Beach -- that aforementioned nearby seasonal community--there is an entire supply side fashion industry devoted to serving their distinctive clothing needs that includes Armani, Chanel, Escada, Ferragamo, Pucci, Louis Vuitton, Ungaro, and Valentino, among numerous others, and of course, Stubbs & Wootton, which got its start in Palm Beach and whose famous embroidered velvet shoes are de rigueur for sockless men out on the town. There also is a sparkling array of jewelry stores as well, including Cartier, Chopard, Graff and Tiffany & Co., whose heavily insured creations were certainly topics for discreet cocktail conversations during the black tie event. 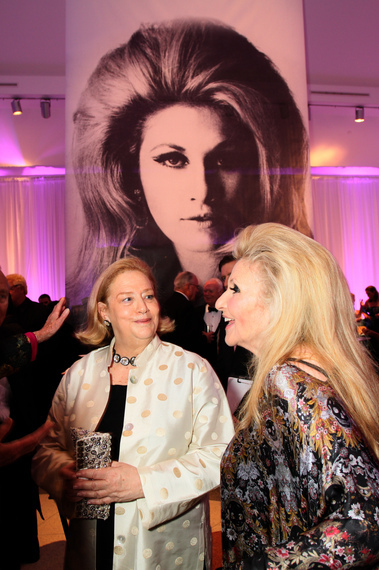 Out and about practically every night between December and April, Palm Beach Society supports hundreds of charity events -- the Norton gala being one of the best -- that make keeping up with the Jones' a demanding but satisfying challenge. The seriously fun, sold out opening night event, which was co-chaired by patrons Annie Falk and Tracy Smith, raised over $700,000 for the museum, featured a private preview, champagne reception, and fabulous dinner. The 350 super-stylish guests complemented the super-stylish outfits on display that were once worn in the 1960s by Baby Jane Holzer, who had donated them originally to The Metropolitan Museum of Art that in turn loaned them to the Norton. The line-up of vintage garments previously presented on Vogue-esque mannequins that greeted guests was simply stunning, and included vintage outfits by Betsey Johnson, House of Chanel, Paco Rabanne, Ungaro, and Yves Saint Laurent. Holzer, a homegrown, born and bred Palm Beach gal who owns properties neighboring legendary boutiques on Worth Avenue, arrived in a beautiful outfit by Alexander McQueen (see my review titled "Savage Beauty" at The Huffington Post that stunned the crowd. There was no doubt that Jane was Tom Wolfe's "It Girl" again as the embroidered and print dress for the evening was a de facto work of art and a perfect choice for a leading lady. Her legendary hair, once described by Wolfe as an amazing mane, seemed to elegantly defy gravity as she darted about greeting friends. Many of the guests wore threads that reproduced Warholian imagery (primarily Marilyn Monroe and his famous flowers) and a few printed outfits that reproduced paintings by other famous artists. We took a quick look at the action during the cocktail reception and captured some great images by hotshot photographer Christopher Fay, who like the exclusive fraternity of Palm Beach photographers, seemed to know everybody by their first names.